If you’re in the greater Los Angeles area for more than three days, I highly recommend you make a two hour drive north to visit California’s Central Coast for some great food and wine (the alternative is two hours south to see San Diego). Following the footsteps of Miles and Jack (characters from the film Sideways), you should visit Santa Barbara, Solvang and the wineries in Santa Ynez Valley, which are famous for their Pinot Noirs. To get there, just hop on the US 101 North from downtown LA. You can also take US 1 (Pacific Coast Highway or PCH) if you’re in a mood for a scenic drive – although you can still see a lot of the beautiful Pacific coast line and ocean from the 101. It takes approximately two and a half hours to get to Solvang, taking into account traffic getting out of LA and around Thousand Oaks and Ventura. You should stop by Santa Barbara to split up the long journey; it has a large, beautiful downtown area with plenty of restaurants and shops. The beaches at Santa Barbara are also amazing. Where to stay in Solvang? For the points focused travelers like Statusmonger and the Coach, there is a very nice Marriott in Buellton which is right off US 101, and a Holiday Inn Express within walking distance of downtown Solvang. I recommend the Marriott; during my stay at the Holiday Inn Express, noise was a small issue because of its location on the main street of downtown Solvang, and the building felt old. Where to eat in Solvang? I highly recommend the Hitching Post II, where Maya from Sideways worked. The Hitching Post II was the best meal I had in 2009 (read my Yelp! Review here). They serve great wine, too – definitely try their Highliner Pinot Noir! Another good place for evening dining is AJ Spurs, a little chain in the Central Valley of California. AJ Spurs serves large portions so order to share unless you haven’t eaten for days. But stay with the meat entrees; the fish dishes aren’t as fresh. 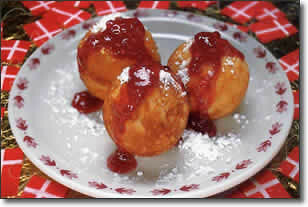 While you’re in Solvang, you must try the Aebleskiver, which is a Danish pancake. There are several bakeries in the downtown area that will make it fresh for you – I think the Solvang Restaurant at 1672 Copenhagen Drive offers the most authentic Aebleskiver. Where to drink in Solvang and the Santa Ynes Valley? I suggest visiting these wineries: Dierberg, Rideau, Fiddlehead, Foley and Melville. If you don’t want to drive all the way to Foxen Canyon Road, where most of the wineries are located, you can stay in downtown Solvang, which has tons of tasting rooms that offer wines from many regional wineries. If you don’t have a designated driver for a wine tour, the local hotels should have bus tours throughout the day. Thank you for sharing excellent informations. Your website is so cool. I am impressed by the details that you’ve on this website. It reveals how nicely you perceive this subject. Bookmarked this website page, will come back for extra articles. You, my friend, ROCK! I found just the info I already searched everywhere and just could not come across. What a great web site.